BFS and its application in finding connected components of graphs were invented in 1945 by Konrad Zuse, in his (rejected) Ph.D. thesis on the Plankalkül programming language, but this was not published until 1972. It was reinvented in 1959 by Edward F. Moore, who used it to find the shortest path out of a maze, and later developed by C. Y. Lee into a wire routing algorithm (published 1961). it checks whether a vertex has been discovered before enqueueing the vertex rather than delaying this check until the vertex is dequeued from the queue. The Q queue contains the frontier along which the algorithm is currently searching. Nodes can be labelled as discovered by storing them in a set, or by an attribute on each node, depending on the implementation. Note that the word node is usually interchangeable with the word vertex. The parent attribute of each vertex is useful for accessing the nodes in a shortest path, for example by backtracking from the destination node up to the starting node, once the BFS has been run, and the predecessors nodes have been set. Breadth-first search produces a so-called breadth first tree. You can see how a breadth first tree looks in the following example. , depending on how sparse the input graph is. is the cardinality of the set of vertices. This is in addition to the space required for the graph itself, which may vary depending on the graph representation used by an implementation of the algorithm. 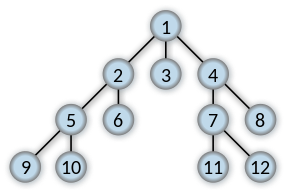 In the analysis of algorithms, the input to breadth-first search is assumed to be a finite graph, represented explicitly as an adjacency list or similar representation. However, in the application of graph traversal methods in artificial intelligence the input may be an implicit representation of an infinite graph. In this context, a search method is described as being complete if it is guaranteed to find a goal state if one exists. Breadth-first search is complete, but depth-first search is not. When applied to infinite graphs represented implicitly, breadth-first search will eventually find the goal state, but depth-first search may get lost in parts of the graph that have no goal state and never return. An enumeration of the vertices of a graph is said to be a BFS ordering if it is the possible output of the application of BFS to this graph. Serialization/Deserialization of a binary tree vs serialization in sorted order, allows the tree to be re-constructed in an efficient manner. Construction of the failure function of the Aho-Corasick pattern matcher. Testing bipartiteness of a graph. ^ "Graph500 benchmark specification (supercomputer performance evaluation)". Graph500.org, 2010. Archived from the original on 2015-03-26. Retrieved 2015-03-15. ^ Zuse, Konrad (1972), Der Plankalkül (in German), Konrad Zuse Internet Archive . See pp. 96–105 of the linked pdf file (internal numbering 2.47–2.56). ^ Moore, Edward F. (1959). "The shortest path through a maze". Proceedings of the International Symposium on the Theory of Switching. Harvard University Press. pp. 285–292. As cited by Cormen, Leiserson, Rivest, and Stein. ^ Skiena, Steven (2008). "Sorting and Searching". The Algorithm Design Manual. Springer. p. 480. doi:10.1007/978-1-84800-070-4_4. ISBN 978-1-84800-069-8. ^ Lee, C. Y. (1961). "An Algorithm for Path Connections and Its Applications". IRE Transactions on Electronic Computers. ^ Cormen, Thomas H.; Leiserson, Charles E.; Rivest, Ronald L.; Stein, Clifford (2001) . "22.2 Breadth-first search". Introduction to Algorithms (2nd ed.). MIT Press and McGraw-Hill. pp. 531–539. ISBN 0-262-03293-7. ^ Russell, Stuart; Norvig, Peter (2003) . Artificial Intelligence: A Modern Approach (2nd ed.). Prentice Hall. ISBN 978-0137903955. ^ Coppin, B. (2004). Artificial intelligence illuminated. Jones & Bartlett Learning. pp. 79–80. ^ Aziz, Adnan; Prakash, Amit (2010). "4. Algorithms on Graphs". Algorithms for Interviews. p. 144. ISBN 978-1453792995. Wikimedia Commons has media related to Breadth-first search.